Here, in the northern hemisphere, on the eve of the winter solstice, the days are short and often gloomy, but we eagerly anticipate the brighter, longer days ahead as the New Year fast approaches. Our students have departed for their Winter Break and soon, many members of the Faculty and Staff will follow. The campus is quiet now, but just as the bright daylight hours increase, so will the campus come alive again as students return to resume their myriad activities on 8 January. The fall has gone by in a flash and I will have a further update for you early in the New Year. At that time, under the heading of Taking Our Responsibilities Seriously, I will share with you a more detailed update on overall campus health, wellness and safety. You may recall in my message last month, I invited you to share any comments you have on several key new or modernized policies that support our commitment to a healthy living, learning and working environment for every member of the Pearson community. I encourage you to review and comment on these policies. While the policy documents are important in establishing and guiding our commitments to all community members, including students, adults on campus and alumni, we think it is critical to recognize that policies are living documents that must be reviewed periodically to ensure we continue to implement leading health, wellness and safety practices. You can help us do this by sending your comments to: respect@pearsoncollege.ca or by contacting Human Resources Officer Shelley Seysener at 250-391-2421 after the Winter Break. In the meantime, I’m pleased to share with you other recent and seasonal events. On 3 November we hosted guests for the Annual General Meeting (AGM) of Pearson College UWC in Toronto. Incoming Chair, the Honourable Anne McLellan, and Vice Chair Christine Healy (YR 15/1990, Canada-NL) were warmly welcomed. A heartfelt tribute was paid to departing Chair Tony Macoun and Vice Chair Jean Drouin for their devoted service to the Board and the entire Pearson community. I am pleased to say that, while stepping down as Chair, Tony has graciously agreed to remain on the Board to serve as a Director. If you have not already had a chance to review our three-part annual report (Stories, Generosity, Financial Statements), I encourage you to review this informative look back at our 2016-17 academic and fiscal year. On 14 and 15 November, I joined a group of keen and committed students who, together with Dean of Studies Emily Coolidge and Pearson Vice Presidents Ty Pile and Dan Hurley (both of whom have military backgrounds), attended the United Nations Peacekeeping Defence Ministerial Conference in Vancouver. We were thrilled that current student Adrita (PC YR 43/2018, Bangladesh) had an opportunity to address Youth as Peacebuilders delegates. Later, Adrita & Ivonne (YR 43/2018, Mexico) spent time with former Governor General and current Secretary General of La Francophonie, Michaëlle Jean, and The Romeo Dallaire Child Soldier Initiative founder, and noted Canadian peacekeeper Lt.-Gen. Roméo Dallaire (ret.). 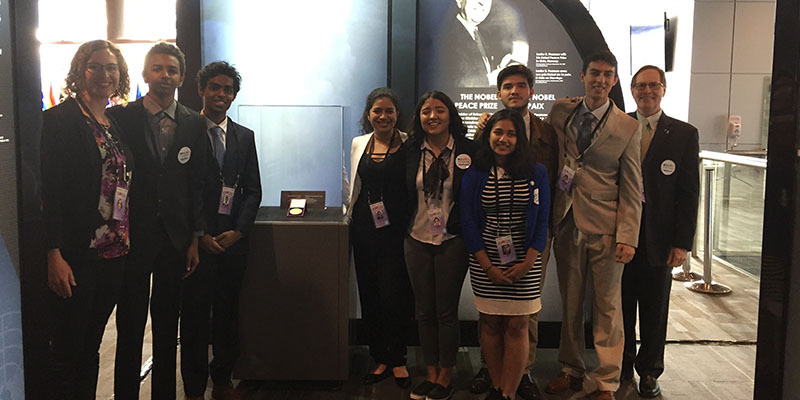 A few days later, seven Pearson students involved in the Model United Nations (MUN) CAS participated in the ConnectMUN in Vancouver, winning three awards! In the Commonwealth Committee, Clara Lilije (YR44/2019, Germany) received the Distinguished Delegate Award, representing as a delegate for India. In ASEAN, Naomi Tang (YR44/2019, Hong Kong) got the Outstanding Delegate Award for her role as the delegate of the Philippines. Juan Daniel Arias (YR44/2019, Costa Rica) received an Honourable Mention, speaking in the UNEP (United Nations Environment Programme) committee as the delegate of Panama. Mr. Pearson would have been proud of our students’ participation in these activities, particularly as both peacekeeping and the United Nations were institutions very close to his heart. Speaking of Mr. Pearson, I have often heard students, colleagues and neighbours say that it would be great to know more about who he and how his life, values and vision shape the College that bears his name and continues to take its inspiration from his achievements. The past two months have seen a number of awareness-building and celebratory events either sponsored or cohosted by the College to mark the 60th anniversary of Lester B. Pearson’s Nobel Peace Prize ceremony on 11 December 1957. With events taking place in Toronto, Victoria and Ottawa, as well as on campus, our College did more than any other non-governmental organization to mark this special occasion. I have created a detailed summary of these events, together with links to related videos and documents, that I encourage you to explore elsewhere in this newsletter. This summary will also be posted to our 60th anniversary webpage. Please keep an eye on this page throughout the first half of 2018 as we will continue to recognize and honour our inspiration Mr. Pearson, during the entire academic year. While 60th Anniversary events were a major focus of the past several weeks, life on campus for faculty, staff, volunteers and students continued with numerous activities. Since the beginning of the school year, committed long-time alumni-in-residence (the “Tiny House” owner) and College librarian Dani McArthur has shepherded a Digital Archive Project intended to gather, collate and organize historical material associated with the College on an accessible digital platform. This initiative, supported by a Canada 150 federal grant, enabled us to hire University of British Columbia (UBC) Library Sciences student Monique Grenier who has worked tirelessly with Dani and a group of equally-committed volunteers and students on this important initiative to ensure that our history is preserved and honoured as we approach our 50th anniversary in 2024. Elsewhere in this month’s newsletter, you will find a short video featuring Monique who provides a summary of the project and a social media page where you will be invited to share information about archival images to help us identify people and places. Among my favorite events on campus are the three Regional Days that normally take place during the first term of the academic year. 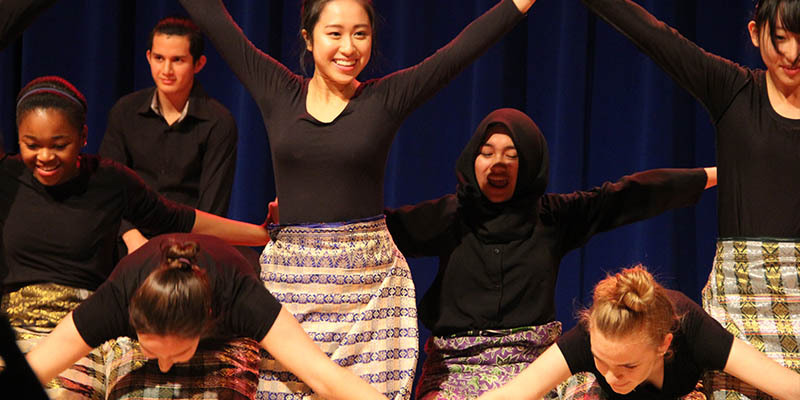 This fall, students from all countries and cultures created and performed at the Max Bell to wildly-appreciative campus and local community audiences. The regional rotation this year featured North America, Asia-Pacific and, most recently, Middle East and South Asia. These events are always a delight that leave audience members amazed at the musical, theatrical and other creative arts talents on display by our students. Congratulations to all the students, advisors, faculty members, volunteers and other members of the campus community who create these very professional events. Throughout November, we celebrated philanthropy on campus with a fundraising campaign that invited staff, faculty, students and volunteers to contribute. Our beautiful campus exists today because of the generous contributions of donors dating back to 1973, and I was inspired to see strong participation from the Pearson community. 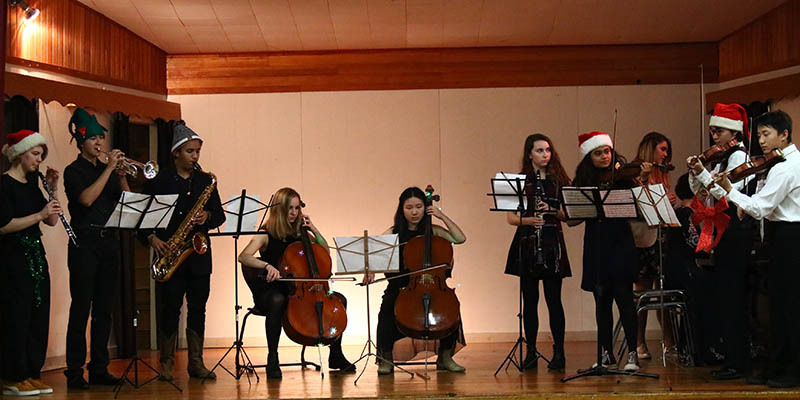 In many respects, the local holiday season “officially” gets underway with the annual Metchosin Holiday Concert. On 3 December, the Pearson Community Choir performed at this joyful occasion. While the performers receive, and deserve, public recognition, there are many unsung (pun intended!) heroes and heroines involved in their success: stage managers and tech crew, transportation organizers and drivers — volunteers who all play important roles and deserve huge thanks. Looking ahead, as soon as students return from winter break, they will be planning and rehearsing for One World, the great showcase for all our student talent. Auditions start on 17 January, two months before the 17 March performances at Victoria’s downtown McPherson Playhouse. It is always such a magnificent show and I encourage you to consider purchasing your tickets early – if gift-giving is a part of your Christmas holiday season, One World tickets make great stocking stuffers for those who live in or expect to be in the Victoria area in mid-March. This link should take you directly to the Royal and McPherson tickets site. Don’t forget to tell your friends! I look forward to seeing you there. 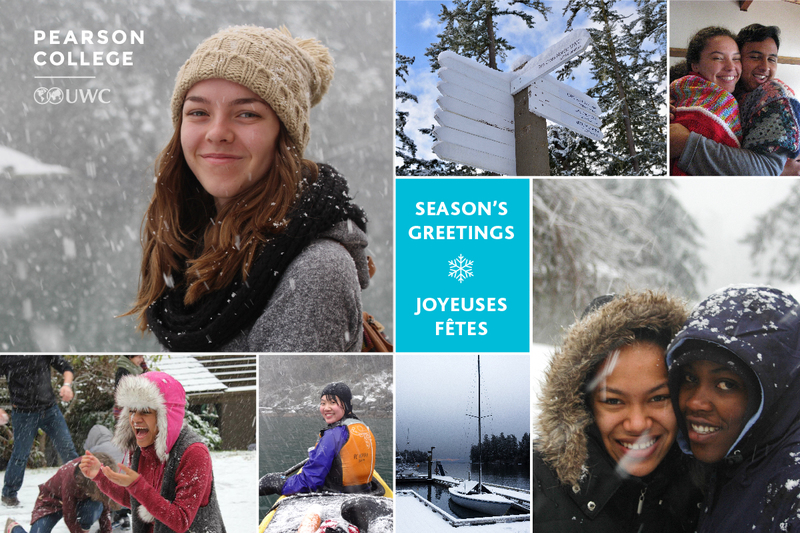 In closing, I extend my warmest wishes to you and your families for a happy, healthy and peaceful holiday season surrounded by loved ones, and a New Year that brings Joy and Peace to the world.